It boasts the same Core i5 processor as the Dell G3 15 which allows for hyperthreading, a cutting-edge technology only seen in i7 processors, which are a considerable price jump. However, its base GTX 1050 graphics card leaves much to be desired in the way of performance, as the 1050 is now on the lower end of the Nvidia 10 series line. Although this laptop is marketed as a 15-inch laptop, it should be noted that the bulk of its build makes it a tight fit into some cases and backpacks. Typically priced between $850-$900, the Dell G3 15 promises consistent performance that remains impressive for its price point. Upgrades and downgrades can be chosen for the G3 15, but the specific model we’re referencing here is the 3579. 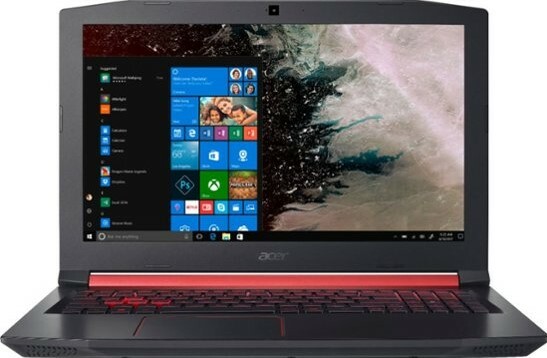 Although the G3 15’s lackluster frame rates and dim display are examples of the comprises made when buying a budget gaming laptop, it still packs a punch. It’s run by the Core i5-8300H which allows hyperthreading, optimizing the efficiency of not only your gaming but also your work or streaming. Its 1050 Ti graphics card struggles to reach 60 fps on most recent AAA games, but runs at a consistent frame rate, nonetheless. Although many gamers will be using peripheral keyboards and mice to play, some users may play games with the G3 15’s standard trackpad and keyboard. Both of these are designed to avoid accidental inputs. In addition, the keyboard contains a numpad, great for data entry, causing the track pad to be off-centered as it is located under the space bar instead of in the middle of the laptop. As far as build quality goes, the G3 15 is a sturdy, blandly designed laptop: nothing extra, flashy, or gaudy. This is great for those who don’t want to announce to the world that they can play video games on their work or school laptop.